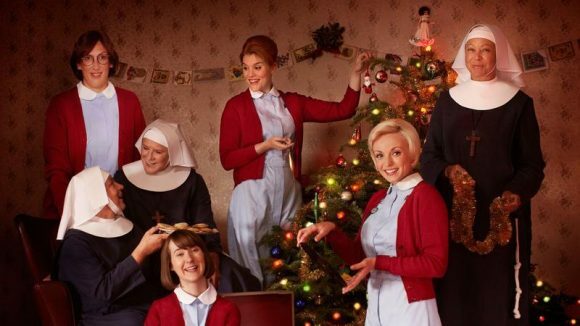 TVNZ 1 will deliver the Call the Midwife Christmas Special 2016 within 12 hours of the BBC’s broadcast. It will air Christmas Day in the UK whereas TVNZ 1 will premiere it 8.30 on Boxing Day (see the trailer here). According to the blurb, “As Poplar celebrates a white Christmas, Nonnatus House receives an SOS call from Hope Clinic, a tiny mission hospital in South Africa that is understaffed, underfunded and threatened with closure. Season eight of Call the Midwife will screen early next year on BBC One, which has renewed the series for three more seasons (through to 2020). TVNZ 1 also has scheduled festive HD editions of Posh Pawn, Mrs Brown’s Boys and The Secret Life of … as well as two network movie premieres. And on Christmas Eve TVNZ 1 will screen in HD One Chance (10.55, December 24), The Ides of March (1.35am Christmas Day), Carnage (3.10am, Christmas Day) and The Yellow Handkerchief (4.25am Christmas Day). Dominating Christmas Eve will be Posh Pawn at Christmas and the two-hour Kylie Minogue special, A Kylie Christmas, which will push Coronation Street back to 10.00. Both Posh Pawn at Christmas and A Kylie Christmas will screen again on Christmas Day, sandwiching the 2.50pm variety special, The Queen’s 90th Birthday Celebration. The Queen’s Christmas Message at 6.45 will be followed by The Hundred-Foot Journey, a repeat of Mrs Brown’s Boys: Mammy’s Punch and the premiere of another Mrs Brown’s Boys special. There will be an SD broadcast of the movie Made in Dagenham at 10.20, ahead of the 12.10am repeat of Call the Midwife Christmas Special 2015. The 2016 Midwife Christmas special will air after the documentary, Inside Lego at Christmas, and on December 27, TVNZ 1 will screen the special Secret Life of Children at Christmas after the premiere of the latest puppy love series, Choose the Right Dog For You.